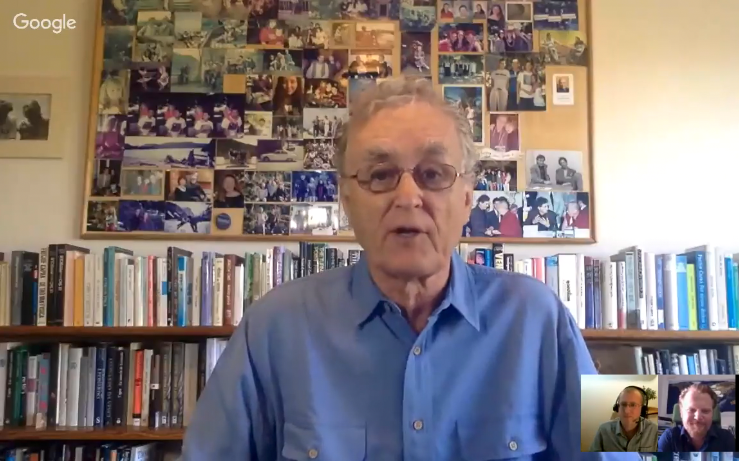 As I am sure many of you will have seen, last Saturday I hosted a webinar with Fritjof Capra in which we discussed a number of themes related to The Systems View of Life. Fritjof Capra is one of the world’s leading thinkers in systems theory and the author of many influential books, such as The Tao of Physics; The Web of Life: A New Synthesis of Mind and Matter; The Turning Point: Science, Society and the Rising Culture; The Hidden Connections: A Science for Sustainable Living; and Learning from Leonardo: Decoding the Notebooks of a Genius. I started the webinar by taking the opportunity to discuss the Earth Charter Initiative with Fritjof, who is one of the Earth Charter Council’s leading members. The Earth Charter was first considered in 1987 when The World Commission on Environment and Development (known as “the Brundtland Commission”) launched their Our Common Future report, with a call for a “new charter” to set “new norms” to guide the transition to sustainable development. The Earth Charter is an ethical framework for building a just, sustainable and peaceful global society in the 21st century. It seeks to inspire in all people a new sense of global interdependence and shared responsibility for the wellbeing of the whole human family, the greater community of life and future generations. It is interesting that many commentators are now discussing the way in which the word ‘sustainability’ is losing its meaning, and therefore usefulness. A word now being used in its place is “regeneration”. One example is Herbert Girardet’s article from the Guardian: Sustainability is unhelpful: we need to think about regeneration. In this section I asked Fritjof if he could you talk a little about the need to shift from life-destroying to life-enhancing ways of doing business? And as one of the world’s most highly-respected ecological activists, is it indeed the case that we need to find new ways of framing the sustainability discussion? I also asked Daniel about his work over many years implementing regenerative projects, and he discussed the Regenerative Development to Reverse Climate Change initiative of the Commonwealth Secretariat in depth. Many people nowadays are interested in how they can help change the collective consciousness of people inside businesses in order to evolve more life-enhancing ways of business. On Capra Course, Fritjof’s on-line course the module Life and Leadership in Organisations always generates many discussions, particularly the part where Fritjof discusses his concept of meaningful disturbances. In our new book Customer Experiences with Soul: A New Era in Design we discuss Fritjof ‘s characterisation of living systems and the notion of both ‘meaningful disturbances’ and ‘networks of communication’. In our business consultancy work we find business leaders really respond to it when implementing programmes of profound organisational change. So in Part Three I took the opportunity to ask Fritjof to talk more about this term, asking where the inspiration come from and what are the implications for business leaders. We closed our discussion talking about Capra Course. In the last few years many businesses have recognised a need to introduce systems thinking across their organisations, and Capra Course is an ideal way to scale up the understanding of systems thinking. We also discussed the merits and problems of written documents in general, from Paolo Freire’s notion that literacy enables people to imagine the world differently, to the problem that such documents — the Earth Charter, the Declaration of Independence or the recent Paris Climate Agreement — represent the level of consciousness of the authors at a particular time and fixes the agreed-upon values in time and space. It was wonderful to be able to converse with Fritjof and Daniel on such interesting topics, and I hope you have a chance to listen to our conversation. And if you yourself would like the opportunity to learn from Fritjof, registration is now open for the Fall 2017 edition of Capra Course. To find out more, please visit www.capracourse.net.